The N/D468 is a supercardioid moving-coil dynamic microphone with a pivoting head design. It uses the same basic capsule assembly as the Electro-Voice N/D767, and as such can serve equally well on vocals as on instruments. These mics are small and easy to place. The additional adjustment capability provided by the yoke-mounted capsule assembly is a significant improvement over one-piece designs. The top half of the grille is easily removed, revealing the dynamic capsule underneath. The coil appears to measure approximately 7/8'' in diameter. Let me put in a good word for the N/D 468. It’s more or less like a Sennheiser 441 in pattern and tone, but it’s a whole lot smaller so you can get closer in without worrying so much. It’s also a lot cheaper. It’s not as clean as the 441 at high levels but that’s sometimes a good thing. The N/D 468 sounded wonderful. With the amp dishing out clean tone at moderate volume, the mic captured every nuance of a Strat’s spankin’ attack: chords shimmered, string pops popped hard, and vibrato and sustain sounded rich, real and detailed — with none of that nasal, rolled-off sound some dynamic mikes produce. The 468 performed will when we cranked up some distortion. It delivered a balanced tone with the mic about three inches from the speaker. Moved closer, the 468’s hefty proximity effect yielded thumping low end that made the amp sound more like a monster stack than a mid-powered combo. 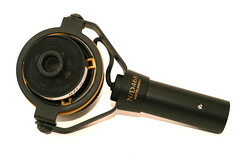 The Electro-Voice N/D468 is also known as: ND468, N/D468.